Want to get your child on TV shows and movies? Central Casting casts minors from 15 days old to 17 years old to work in movies, TV shows, commercials, and many other productions. Here's everything you need to know about registering your child and getting on set. What kind of roles for kids does Central Casting cast? We cast children to be Background Actors and photo doubles. A Background Actor (also called extra, background talent, and atmosphere) is someone who performs in a show in a nonspeaking role, usually in the background. They're students at a school, friends at a birthday party, and players on a soccer team. A photo double is a person who appears on screen when an actor's face does not need to be shown. There are strict rules for how long children can work, so many productions will use a photo double to take a principal child actor's place when he or she does not need to be on camera. This allows the crew to keep filming while the principal actor is fulfilling their school or other requirements. How can my child become a Background Actor? To get your child on TV shows and movies, the first step is to register them with Central Casting. We hold registration sessions for minors every week in our offices in Los Angeles, New York, Georgia, and Louisiana. Choose your location on our Kids page for detailed information on the registration process in each office. When you and your child come to registration, you will fill out an I-9 form on their behalf. Part of the I-9 process is having the correct documentation. Read through our minors I-9 required documentation packet before coming to registration so you know what original unexpired documents you need to bring with you. Your child will also take a photo for our casting system. This is the photo Casting Directors will see when they look up your minor's file. Keep in mind that Directors, Assistant Directors, and other members of production may see this photo during the casting process, so make sure your child is camera ready when you come to registration. Does my child need a work permit? All children will need a work permit in order to work on set. The work permit process is different in each state; if you have specific questions about your state's requirements you can contact your Central Casting office. To obtain a work permit, a parent or legal guardian will need to fill out an entertainment work permit application with the California Department of Industrial Relations. In order to receive a work permit, you will need to show proof of the minor's age and have the child's school verify that the student has good grades and attendance. California requires minor entertainment work permits to be updated every six months. Central Casting will need these updated permits on file for your minor to be considered for work. You can email a new or updated California work permit to workpermitupdate@centralcasting.com. To apply for a work permit it New York, a parent or legal guardian will need to fill out the child performer permit application from the New York Department of Labor. To be approved for a work permit, the state requires a note from the child's school, a doctor's visit for the minor, and for a trust account to be set up for the child. Once the Department of Labor accepts the application, it usually takes about a week for you to receive the work permit. In order for Central Casting to obtain a work permit for your child, they must be issued a certification number from the state of Georgia. You can obtain a certification number by filling out a short form on the Georgia DOL website. Bring that certificate number with you when you register your child at our Atlanta office. If you are already registered with Central Casting Georgia, send your child's name and certificate number with the subject line "GDOL Certificate" to georgiainfo@centralcasting.com. Work permits are issued per project and must be approved five days before the child's first day of work. In order to secure a work permit for the child, Central Casting will need the following documents on file: parental consent form (part of the packet you fill out when you register your minor), a copy of the minor's Social Security card, and a copy of the child's birth certificate or state issued I.D. These documents are used to verify the minor's date of birth. There are many tools you can use to get your child on TV. Casting Directors may send you a text message, call you directly, or you can look through our job posts. You can find what roles we're casting for minors by going to the job posts section of your location's Kids page. In the post, the Casting Director will give information about what they are looking for and give specific submission instructions. Be sure to read these carefully before submitting your minor for any projects. If a Casting Director books your child, they will give you your minor's work details. Please write this information down, including the project name, the Casting Director who booked your child, where and when to report, to whom you report, and any wardrobe information. You may receive an additional resource, like a link to a details or wardrobe blog. An important part of the casting process is keeping your child's file and photo up to date. Casting Directors use their photo and information like your child's sizes to see if they are the right fit for roles. You can come in to an Updates session to change your minor's information or have them take a new photo. We recommend updating photos every six months, but if you haven't had a chance to bring your child in recently, let the Casting Director who booked you know of any changes to their sizes or appearance. Check your location's calendar for minors Update times in your office. Now you know how to get your child on TV and movies. Read our article What to Do When Your Minor Books a Job to learn everything you need to know about being on set with your child. 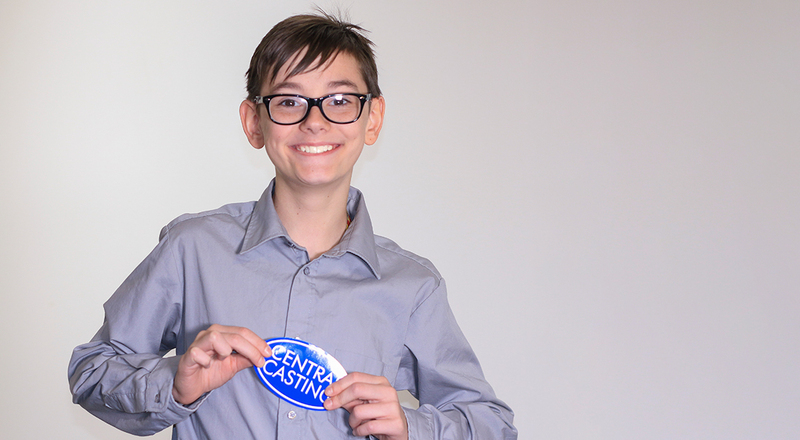 Which Central Casting office will you register your minor at?